The photo anchoring a web page for Lehigh University’s Baja SAE team ostensibly shows four impressively large trophies—a collection suggesting a tale of competition and victory. But the picture’s other details suggest an even deeper, more multilayered story. The prizes perch on a hand-built, dune-buggy-like, off-road vehicle framed by roll bars and sporting fat, gnarly tires. 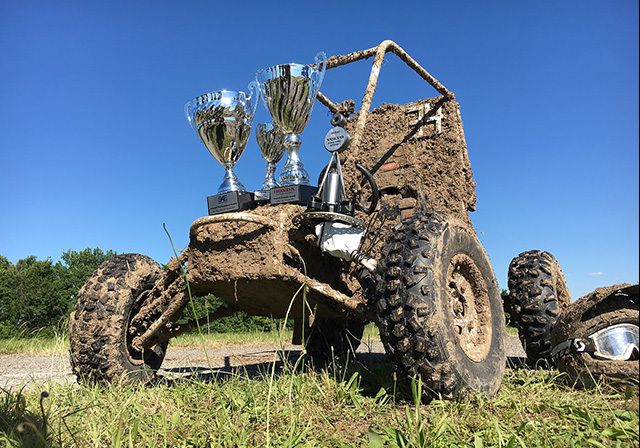 Designed and built by Lehigh students for competitive events sponsored by the Society of Automotive Engineers, the vehicle sits on a scrubby patch of grass off a dirt trail and—in sharp contrast to the gleaming swag—is caked from top to bottom with thick mud. Implied in this picture-worth-a-thousand-words are a backstory of passion, effort, grit, technical know-how, collaboration, execution, and success. All of those elements came into play during two years in which the student team designed, manufactured, and tested an off-road vehicle that they then took to two 2017 competitions, in Kansas and Illinois. At each event, Lehigh students pitted their vehicle against those from about 100 teams from around the world—some from larger schools with major corporate sponsorships—in tests of technical requirements, engineering, and cost-effectiveness. Vehicles that passed a technical inspection also competed in dynamic events such as tests of traction, suspension, acceleration, maneuverability, and hill climbing, culminating in a four-hour endurance race through obstacles like jumps, hairpin turns, rugged terrain, and creeks. Hence the mud. While classroom teaching remains important, students increasingly have opportunities to find hands-on interests and projects for which they are truly passionate. These build on what they’re learning in the classroom, have a tangible impact in the world and prompt them to think about where their experiences and classroom learning together might lead in their careers. That vision more closely mirrors what students will encounter once they graduate. "The world isn’t black-and-white like a high-school calculus test,” DeWeerth says. “Real-world problems almost never have exact answers, otherwise they’re not actual problems. Yet that black-and-white approach is typically how we’ve educated in the past. Experiential learning avoids so-called toy problems. The real world is: Here’s a problem, we don’t know what the answer is, there isn’t a perfect answer, but there are some good answers—and bad answers—and you have to go explore that space,” he says. Pathways to experiential learning already exist at Lehigh. Industry internships have long been a way for students to gain practical experience. “They’re becoming almost essential for us now,” DeWeerth says. Student research with faculty—common among graduate students—is becoming increasingly common among undergraduates. A large percentage of students take part in international experiences that allow them, for example, to apply classroom knowledge in disciplines such as engineering or computing to solving problems in developing countries. Service learning opportunities enable students to apply scientific or engineering skills to help communities or address social issues. Competition teams and clubs such as Baja SAE or Formula SAE — a similar club that designs and builds a Formula-style race car—encourage students to apply engineering and critical thinking skills in scored effort competitions that participants hope will outperform those of rival teams. Some projects meld multiple forms of opportunity. Combining service, competition and international experience, one Lehigh group — Team Soterra — is among 21 out of 85 teams from around the world that advanced to the semifinal round of the international Anu and Naveen Jain Women’s Safety Prize offered by the XPRIZE Foundation, a nonprofit that encourages innovators to develop technological solutions to pressing problems. The Lehigh team is developing a handheld device that allows users who feel threatened to quickly alert preselected personal contacts or police. The device employs a Bluetooth mesh networking solution along with GPS technology that will pinpoint a user’s location with 50 times greater accuracy than a triangulated cell signal. Students are developing the device in hopes of reducing violence against women, especially in areas of the world where cell phone ownership is low. A number of Lehigh initiatives encourage these kinds of experiential activities. The Mountaintop Initiative allows students to work freely across disciplines in pursuit of innovative, creative answers to open-ended problems and questions. The Baker Institute for Entrepreneurship, Creativity and Innovation fosters and champions entrepreneurial culture, nurtures creative thinking, and provides opportunities and resources for students across disciplines to put innovative ideas and technologies into practice. According to DeWeerth, TE Capstone is a model for growing Capstone Design across the College due to its client-driven emphasis on real-world problems and its interdisciplinary approach. Building and emphasizing interdisciplinary team science and experiential learning—whether faculty-led research, international opportunities, industry experience, service learning, or competition teams—not only helps students learn; it also supports broader strategic goals of growing Lehigh’s research output, productivity, impact, and reputation. To further develop a culture in which students search for and explore passionate interests that can focus and drive their academic pursuits, the college plans to begin a peer-mentoring program in fall 2018. Building on a university-wide program, student mentors who have participated in experiential learning will help introduce the idea to diverse first-year students. “The goal is that by the end of the first semester, incoming students will each write an experiential learning plan that starts them thinking about the opportunities that are available and what they hope to do during their four years at Lehigh,” DeWeerth says. Plans drawn up so early in an education are expected to change. But whatever journey students go on, by the end of four years it’s hoped they will have portfolios of experiential projects that show the fruits of their education beyond deskbound classes and a grade point average. “We need to start feeding students that mindset even before we start feeding them skillsets and knowledge,” DeWeerth says. Thinking in terms of meaning, passion, and opportunity often leads to a more creative and entrepreneurial outlook. That's a key goal of curriculum design encouraged by the Kern Entrepreneurial Engineering Network (KEEN), a collaboration of colleges and universities dedicated to developing an entrepreneurial mindset in engineering students. KEEN, an initiative of the Kern Family Foundation, has provided funding to Lehigh for three years. "When we finish the latest phase of our grant, we will have more than half of the faculty members in our college involved in developing or applying entrepreneurial mindset learning in their courses," DeWeerth says. "They're asking, 'How do I expand the way I educate beyond standing in front of a classroom three times a week?' They're being creative in their pedagogy, and the fact that it has impacted so much of our faculty means we're making a cultural change." The shift has drawn in students as well. "At Lehigh, we've paired faculty members with students to develop activities around what students feel would be helpful to them as learners," Tonkay says. "We're actually starting from the student's point of view and working up." Promoting this entrepreneurial mindset may inspire students to develop products and start companies. "This is an area where we've seen rapid growth across the country," DeWeerth says. "We have some of that at Lehigh and I think it will continue to grow both here and elsewhere. Whether products or companies succeed or not, learning an entrepreneurial mindset will permeate whatever a student's career becomes." If an idea does succeed, students have ownership. "Even if university resources or fabrication facilities are involved, as long as it wasn't funded by the university or federal sponsors, students are able to use their intellectual property," DeWeerth says. "They own their ideas." Like experiential learning as a whole, that's a win for Lehigh, he says: "Our goal is the success of our students."